By John Kruzel on Monday, July 16th, 2018 at 1:22 p.m.
U.S. law enforcement agencies and Congress are investigating links between Donald Trump’s presidential campaign and Russia, as part of a broader probe into Moscow’s interference in the 2016 election. To date, Special Counsel Robert Mueller’s investigation has resulted in five former Trump aides agreeing to work with Mueller’s team under plea deals. Numerous Trump associates had contacts with Russian government officials or business people during the campaign and presidential transition. As the investigation has unfolded, the Trump team’s stories have changed, recollections have been refreshed and government officials have come forward with new assessments of the intelligence. This timeline documents everything we know thus far about the investigation into the Trump campaign and Russia. The sources are either verified events, court filings, public statements, or on-the-record media reports. Have feedback or questions? Email us. Oct. 28, 2015: Trump signed a letter of intent to negotiate the construction of a Trump Tower in Russia, as first reported by CNN. January 2016: Michael Cohen, Trump’s longtime lawyer, emails Russian President Vladimir Putin’s press secretary Dmitry Peskov about plans to build a Trump Tower in Moscow. Later, Cohen would falsely testify to Congress that the deal ended this month. In fact, discussions about the project lasted as late as June 2016. Early March 2016: George Papadopoulos joins the Trump campaign as an adviser. While traveling in Italy in mid March, Papadopoulos meets a London-based professor whom Papadopoulos understood to have "substantial connections to Russian government officials." April 2016: Papadopoulos’ professor source tells the Trump adviser about a meeting with high-ranking Russian government officials in Moscow who have "dirt" on Hillary Clinton in the form of "thousands of emails." May 2016: Donald Trump, Jr. meets with Alexander Torshin at National Rifle Association convention in Louisville. Torshin is a former senator and deputy head of Russia's central bank. Goldstone tells Trump Jr.: "This is obviously very high level and sensitive information but is part of Russia and its government’s support for Mr. Trump." The younger Trump replied that same day: "If it’s what you say I love it." June 7, 2016: Trump announced he would soon make a "major speech" on Clinton. June 9, 2016: Trump, Jr., Manafort and Kushner meet with a Russian national and several others at Trump Tower, based on Goldstone’s promise to Trump Jr. that a "Russian government attorney" would deliver damaging information about Clinton. Several shifting accounts of the meeting were later offered. June 14, 2016: The DNC announced, through cybersecurity firm CrowdStrike, that it had been hacked by Russian government actors. June-July 2016: WikiLeaks and DCLeaks release thousands of documents about Clinton and internal DNC deliberations. Early July 2016: Trump campaign adviser Carter Page travels to Moscow, where he meets with Russia’s deputy prime minister and a high-ranking Russian oil official. Page emails campaign staffers that the deputy prime minister had "expressed strong support for Mr. Trump," and that he had gleaned "incredible insights and outreach" in Russia. Mid July 2016: Trump campaign associate J.D. Gordon successfully lobbies for the GOP platform to be changed to benefit Russia. Language is inserted vowing not to provide lethal aid to Ukrainians in their fight against Russian-backed separatists. July 18, 2016: Sessions talks with Kislyak after Sessions’ speech at the Republican National Convention. July 20, 2016: Sessions talks with Kislyak after a speech. Separately, Trump campaign associates Page and Gordon meet with Kislyak. July 22, 2016: WikiLeaks begins releasing DNC emails ahead of the Democratic National Convention. The first tranche — nearly 20,000 emails — reveals an embarrassing glimpse at internal DNC deliberations. Late July 2016: A senior Trump campaign official was directed to contact Trump’s longtime friend and associate Roger Stone about any additional WikiLeaks releases, and what additional damaging information the group possessed on the Clinton campaign. July 25, 2016: The FBI publicly confirms its investigation into the DNC hack. July 2016: The FBI opens a counterintelligence investigation into links between the Trump campaign and the Russian government. Republican members of the House Intelligence Committee later confirmed that information from Papadopoulos triggered the investigation. July 27, 2016: During a press conference, Trump says of Clinton’s emails: "Russia, if you’re listening, I hope you can find the 33,000 emails that are missing. I think you will probably be rewarded mightily by our press." July 27, 2016: Russians for the first time begin to target Clinton’s emails. August 27, 2016: Senate Minority Leader Harry Reid, D-Nev., sent a letter to FBI Director James Comey asking the bureau to investigate alleged Russian interference in the election. Reid also raised concerns about contacts Trump campaign members reportedly made with WikiLeaks and Russian nationals under U.S. sanction. September 2016: Sessions meets with Kislyak in his Senate office. Oct. 7, 2016: The U.S. intelligence community releases a statement saying the release of emails on DC Leaks and WikiLeaks "are consistent with the methods and motivations of Russian-directed efforts." "The U.S. Intelligence Community is confident that the Russian Government directed the recent compromises of e-mails from U.S. persons and institutions, including from U.S. political organizations," the statement reads. Oct. 7, 2016: An Access Hollywood tape is released in which Trump can be heard in a 2005 interview bragging about groping women. Oct. 7, 2016: Less than an hour after the Access Hollywood surfaces, WikiLeaks publishes more than 2,000 emails of Clinton campaign chairman John Podesta. Between this date and the election, WikiLeaks released more than 50,000 documents stolen from Podesta’s personal email account. Mid October 2016: Trump Jr. corresponds with WikiLeaks through Twitter’s private message service. WikiLeaks asks the younger Trump to direct his Twitter followers to its trove of documents. Fifteen minutes later, candidate Trump tweets about WikiLeaks. Two days later, Trump Jr. tweeted a link to WikiLeaks’ archive. Oct. 21, 2016: The FBI and Justice Department obtain a warrant to monitor Page based on probable cause that Page is Russian agent. Page stepped down from the Trump campaign the previous month. Dec. 1, 2016: Kushner and campaign adviser Michael Flynn meet with Kislyak at Trump Tower. Dec. 13, 2016: Kushner meets with Russian banker Sergey Gorkov, the CEO of a state-run Russian bank under U.S. sanction. Gorkov was described to Kushner as "someone with a direct line to the Russian president who could give insight into how Putin was viewing the new administration and best ways to work together." Dec. 29, 2016: In the waning days of his presidency, Barack Obama responds to Russia’s interference in the election by expelling 35 Russian diplomats and issuing new sanctions. Late December 2016: Following Obama’s move against Russia, Flynn asks Kislyak to "refrain from escalating the situation." Kislyak later tells Flynn that Russia "had chosen to moderate its response to those sanctions as a result of his request." Dec. 30, 2016: Putin declines to retaliate against the Obama administration’s sanctions. Jan. 6, 2017: The U.S. intelligence community concluded with "high confidence" that Russia engaged in an influence campaign directed at the election. Jan. 10, 2017: In his confirmation hearing to become Trump’s attorney general, Sessions says under oath that he did not have contact with Russian officials during the 2016 presidential campaign. In a separate questionnaire submitted a week later, Sessions denied contacting any Russian officials regarding the 2016 election. Jan. 10, 2017: A dossier compiled by former British intelligence officer Christopher Steele goes public. Steele wrote the dossier on behalf of Fusion GPS, a research firm whose work had been funded in part by the Democratic National Committee and Hillary Clinton’s presidential campaign. The document suggests the Kremlin possesses compromising material against Trump and raises the possibility Trump is vulnerable to blackmail. Jan. 20, 2017: Trump is inaugurated as president. Late January 2017: Flynn, now Trump’s national security adviser, lies to the FBI, falsely claiming that he never discussed the Obama administration’s Russia sanctions with Kislyak. Jan. 27, 2017: During a meeting with FBI Director James Comey, Trump said, "I need loyalty, I expect loyalty," according to sworn testimony Comey would later deliver to Congress. Trump has denied this. Feb. 13, 2017: Flynn resigns after 24 days as national security adviser. Feb. 14, 2017: Trump asks Comey to drop the investigation into Flynn, according to Comey's sworn testimony. Comey says Trump told him: "I hope you can see your way clear to letting this go, to letting Flynn go. He is a good guy. I hope you can let this go." Trump has denied this. March 1, 2017: The Washington Post reports that Sessions met with Kislyak twice over the previous year, encounters that Sessions failed to disclose during his confirmation proceedings. Sessions later confirms these meetings. March 2, 2017: Sessions recuses himself from any "existing or future investigations" related to the 2016 presidential election. March 20, 2017: Comey publicly confirms the FBI’s counterintelligence probe includes "investigating the nature of any links between individuals associated with the Trump campaign and the Russian government and whether there was any coordination between the campaign and Russia's efforts." May 9, 2017: Trump fires FBI Director James Comey. May 11, 2017: Trump tells NBC "this Russia thing" factored into his decision to fire Comey. May 17, 2017: The Justice Department appoints former FBI Director Robert Mueller as special counsel. Mueller will lead the investigation into possible ties or coordination between the Trump campaign and Russian officials, as well as other matters that "may arise directly from the investigation." "It was a short introductory meeting. I asked Jared (Kushner) and Paul (Manafort) to stop by. We primarily discussed a program about the adoption of Russian children that was active and popular with American families years ago and was since ended by the Russian government, but it was not a campaign issue at the time and there was no follow up. July 14, 2017: One of the attendees of the Trump Tower meeting, Russian-American Rinat Akhmetshin, a former Soviet soldier with experience in military counterintelligence, said that after the meeting, Russian lawyer Natalia Veselnitskaya left behind documents for the Trump campaign. According to an interview with the Associated Press, Akhmetshin said Veselnitskaya believed the documents detailed "the flow of illicit funds to the Democrats," and she suggested to the campaign that publishing them could help Trump's electoral chances. Aug. 1, 2017: White House Press Secretary Sarah Huckabee Sanders was asked about a news report that the president had tried to change the narrative around Trump Jr.'s meeting with the Russian lawyer. Sanders says Trump "weighed in" on his son’s statement about the June 9 Trump Tower meeting. Sanders’ statement is inconsistent with previous explanations offered by Trump’s team. Aug. 2, 2017: Trump signs a law imposing new Russia sanctions in response to Moscow’s interference with the election. Congress largely passed the bill — with veto-proof majorities — in response to Trump’s downplaying of the meddling question and his seeming interest in lifting sanctions against Russia, experts said. Oct. 5, 2017: Papadopoulos pleads guilty to lying to the FBI about his efforts to put the Trump campaign in contact with Moscow. He enters a plea agreement with Mueller. Oct. 30, 2017: Manafort and Trump campaign associate Rick Gates surrender to the FBI after being charged with a dozen felonies each, including failing to disclose lobbying activities on behalf of foreign entities, financial crimes and making false statements. They plead not guilty to all charges. Nov. 2, 2017: Page tells the House Intelligence Committee he had notified Sessions about contacts he made with Kremlin officials during his July 2016 Russia. This contradicts Sessions’ previous denials. Nov. 16, 2017: The top Republican and Democrat on the Senate Judiciary Committee send a letter to Kushner’s attorney saying Kushner failed to turn over several documents to the committee. Nov. 30, 2017: Flynn pleads guilty to lying to the FBI about his discussions with the Russian ambassador during the presidential transition, and enters a plea agreement with Mueller. Feb. 16, 2018: The special counsel charges 13 Russians and three Russian entities with conspiring to defraud the United States and interfere with the 2016 presidential election. The Russian government has denied involvement. The special counsel also charged Richard Pinedo with identity fraud. He would later plead guilty. Feb. 18, 2018: Dutch attorney Alex Van Der Zwaan is indicted for lying to the FBI about interactions with Rick Gates and another associate of Manafort. He would later plead guilty and serve a 30-day sentence before being deported to the Netherlands. Feb. 22, 2018: A new indictment is filed against Manafort and Gates containing 32 charges, including tax and bank fraud. Feb. 23, 2018: Gates pleads guilty and agrees to work with Mueller’s probe. Feb. 24, 2018: A new indictment is filed against Manafort alleging he "secretly retained a group of former senior European politicians to take positions favorable to Ukraine, including by lobbying in the United States." April 9, 2018: The FBI raids the offices of Trump’s longtime lawyer and aide Michael Cohen. The case is referred to the U.S. Attorney’s office in the Southern District of New York. April 19, 2018: Memos are released of former FBI Director James Comey, providing his contemporaneous written impressions of several one-on-one discussions with Trump. April 27, 2018: Republican members of the House Intelligence Committee release a final report on the committee’s Russia investigation over Democratic objections. The committee's Republican members found no evidence of collusion between the Trump campaign and Moscow, but concluded that Russia conducted cyberattacks on U.S. political institutions during the 2016 campaign. The committee’s top Democrat, Adam Schiff of California, criticized GOP members for closing the investigation prematurely, and called their findings superficial and politically motivated. Statements made by Cohen about Trump Tower Moscow, which Cohen later admitted were lies, go largely unchallenged in the report. May 1, 2018: Trump reacts angrily to a New York Times report containing a list of questions Mueller is said to have sent Trump as part of the special counsel investigation, calling it a "witch hunt." June 8, 2018: Mueller adds an obstruction charge against Manafort and indicts his business partner Konstantin Kilimnik. July 3, 2018: A Senate panel that independently reviewed the intelligence community’s assessment backed up its findings, concluding that the agencies’ joint assessment was a "sound intelligence product." July 13, 2018: The special counsel indicts 12 Russian intelligence officers for their role in the hacking of the Democratic National Committee, the Democratic Congressional Campaign Committee and the Clinton campaign, and leaking of emails and documents. The indictment made reference to an unnamed U.S. person who "was in regular contact with senior members of the presidential campaign of Donald J. Trump," and who communicated during the election with Guccifer 2.0, a front for Russian operatives. Former Trump campaign adviser Stone acknowledged he is "probably" the U.S. person referenced in the indictment. July 21, 2018: In response to a Freedom of Information Act request, the Justice Department releases a heavily-redacted version of the warrant application used to obtain a wiretap on former Trump campaign adviser Carter Page starting in October 2016, a month after he parted ways with Trump’s team. July 27, 2018: Trump denies a CNN report that he knew in advance about the June 9, 2016, Trump Tower meeting. The report was based on unnamed sources who said former Trump attorney Cohen is willing to confirm Trump's foreknowledge of the meeting to the special counsel. In repsonse, Trump tweeted, "I did NOT know of the meeting with my son, Don jr. Sounds to me like someone is trying to make up stories in order to get himself out of an unrelated jam (Taxi cabs maybe? )," an apparent reference to Cohen's role managing taxi companies. Aug. 1, 2018: Trump calls on his attorney general to end the Mueller probe, tweeting: "This is a terrible situation and Attorney General Jeff Sessions should stop this Rigged Witch Hunt right now, before it continues to stain our country any further." Aug. 5, 2018: Trump tweeted about the June, 9, 2016, meeting at Trump Tower, saying it was "a meeting to get information on an opponent," adding to the series of shifting explanations of the meeting arranged by Donald Trump Jr.
Aug. 21, 2018: Manafort is convicted of eight of 18 felony counts. A jury found Manafort guilty on five tax fraud charges, one charge of hiding foreign bank accounts and two counts bank fraud. A mistrial was declared for the other 10 charges. Aug. 21, 2018: Cohen pleads guilty in federal court to a series of criminal charges, including a campaign finance law violation that implicated the president. His other convictions concern tax fraud and bank fraud. Sept. 7, 2018: Papadopoulos is sentenced to 14 days in jail and a year of supervised release after pleading guilty to lying to the FBI. Sept. 14, 2018: Manafort pleads guilty to reduced charges in exchange for an open-ended cooperation agreement that obligates him to "cooperate fully, truthfully, completely, and forthrightly" with the special counsel’s investigation, and possibly other prosecutors. Oct. 19, 2018: The Justice Department accuses Russians with ties to Putin of operating an "information warfare" targeting the U.S. midterm elections. Nov. 7, 2018: A day after the midterm elections, Sessions resigns at Trump’s request. Trump replaces him with Justice Department lawyer Matthew Whitaker, who, as acting attorney general, would oversee the Mueller probe, which Whitaker had publicly criticized as overly broad. Attorneys for the Justice Department argue Whitaker’s appointment is on solid legal ground. But some constitutional experts say Trump unlawfully sidestepped Congress when he elevated Whitaker without Senate confirmation. Legal challenges soon follow. Nov. 20, 2018: Trump submits written answers to Mueller’s questions. Nov. 26, 2018: Papadopoulos reports to prison to serve a two-week sentence. Nov. 26, 2018: Mueller’s team accuses Manafort of breaching his plea agreement, saying he repeatedly lied to federal investigators. The special counsel's office argued in a court filing that "crimes and lies" Manafort committed after the plea deal relieve Mueller’s team from honoring their end of the bargain. Manafort has denied the charges. Nov. 26, 2018: Pundit and conspiracy theorist Jerome Corsi rejects a plea offer from the special counsel. A draft of the plea deal alleges Corsi gave Stone advance notice in August 2016 that WikiLeaks would release damage information on Hillary Clinton. A subsequent indictment of Stone reiterates many of the same allegations. Nov. 27, 2018: Manafort denies ever meeting with Julian Assange, following a report in The Guardian claiming Trump’s onetime campaign manager held secret talks with the WikiLeaks editor at the Ecuadorian Embassy in London. "I have never met Julian Assange or anyone connected to him," Manafort said in a statement. "I have never been contacted by anyone connected to Wikileaks, either directly or indirectly. I have never reached out to Assange or Wikileaks on any matter." Nov. 29, 2018: Cohen pleads guilty to to lying to Congress about the Russian-based development proposal Trump Tower Moscow. Cohen admitted he lied when he told lawmakers he had only briefed Trump on the project three times, and that negotiations broke down in January 2016. In fact, talks continued as late as June 2016, after Trump became the Republican Party’s presumptive nominee. Cohen also concealed his communications with Kremlin officials, as well as the fact he asked Trump to travel to Moscow to further the deal. He said his lies were intended to harmonize with the Trump campaign’s "political messaging." Nov. 29, 2018: Cohen’s Russian business associate, Felix Sater, said he and Cohen were interested in offering a $50 million penthouse in Trump Tower Moscow to Putin because they believed "it would entice other wealthy buyers to purchase their own." Rep. Adam Schiff of California, the top Democrat on the House Intelligence Committee said Sater’s comment, if true, shows House investigations should continue to probe "what, if any, financial leverage the Russians may hold over President Trump and the Trump Organization." Schiff, who is expected to lead the committee when the Democrats take control of the House in January 2019, said the panel intends to call Cohen back to testify again, as do Senate Democrats. The House committee’s Democratic members also plan to send the special counsel all unredacted transcripts of interviews the panel conducted as part of its Russia investigation. Nov. 30, 2018: Trump responds via Twitter to defend his pursuit of Trump Tower Moscow, describing his business as "very legal and very cool." "Oh, I get it! I am a very good developer, happily living my life, when I see our Country going in the wrong direction (to put it mildly). Against all odds, I decide to run for President & continue to run my business-very legal & very cool, talked about it on the campaign trail … Lightly looked at doing a building somewhere in Russia. Put up zero money, zero guarantees and didn’t do the project. Witch Hunt!" Nov. 30, 2018: The special counsel’s office said it may retry Manafort on previous charges that led to hung jury. Nov. 30, 2018: Lawyers for Cohen request that he be spared prison, citing Cohen’s cooperation with federal investigations, including the special counsel probe. Dec. 7, 2018: The special counsel’s office accuses Manafort of lying multiple times to investigators, in breach of his federal plea deal. Dec. 12, 2018: Cohen is sentenced to three years in prison for financial crimes as well as for lying to Congress. He was also ordered to pay $2 million in penalties. Before the sentence was handed down, Cohen told the courtroom, "It was my own weakness and a blind loyalty to this man (Trump) that led me to choose a path of darkness over light. Time and time again I felt it was my duty to cover up his dirty deeds." Dec. 13, 2018: Maria Butina, a Russian living in the United States, pleads guilty to conspiring to act as an illegal foreign agent. Butina has been accused of trying to infiltrate Republican power circles. Jan. 8, 2019: Manafort’s lawyers submit a court filing denying that Manafort breached his plea deal, as the special counsel’s office alleged. The filing inadvertently revealed that Manafort shared 2016 election polling data with his business partner Kilimnik, whom Mueller had previously charged with of obstruction of justice. Jan. 18, 2019: The special counsel denied a BuzzFeed News report which claimed that Trump directed Cohen to lie to Congress about the Trump Tower Moscow project. In a rare public comment, a spokesman for Mueller said, "BuzzFeed’s description of specific statements to the special counsel’s office, and characterization of documents and testimony obtained by this office, regarding Michael Cohen’s congressional testimony are not accurate." 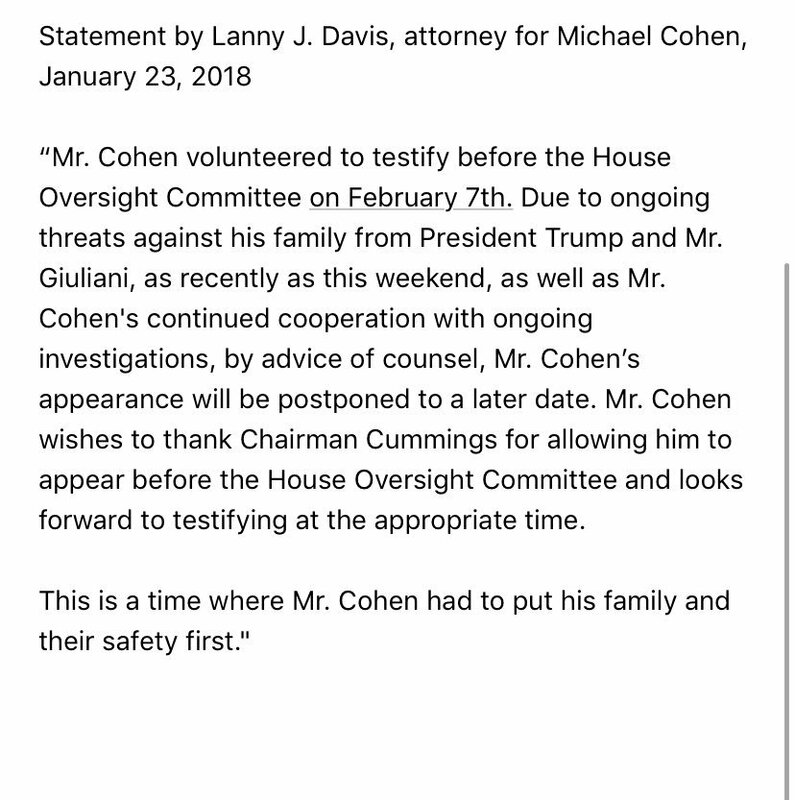 Jan. 23, 2019: Cohen, in a statement from his lawyer, announced he would not voluntarily testify before the House Oversight Committee in coming weeks, as he had planned. Cohen cited "ongoing threats against his family from President Trump and Mr. (Rudolph) Giuliani" as among the reasons for the reversal. The following day, the Senate Intelligence Committee subpoenaed him; he is slated to testify Feb. 12. Jan. 24, 2019: The FBI arrests Trump's longtime friend and associate Stone. He is charged with seven felonies, including lying to Congress under oath, witness tampering and obstruction. The indictment lays out a pattern of behavior that gives the strong impression Stone tried to conceal his contacts with WikiLeaks. March 22, 2019: Special Counsel Robert Mueller concluded his investigation into Russian interference in the 2016 election and related matters. Mueller submitted a confidential report to Attorney General William Barr explaining his "prosecution and declination decisions." Barr told lawmakers who lead congressional judiciary committees in a letter that he would advise them the special counsel's principal conclusions, perhaps as soon as this weekend. White House press secretary Sarah Sanders said the White House had not received or been briefed on the report. She added that Barr would determine the next steps, adding, "We look forward to the process taking its course." "Russia, if you’re listening, I hope you can find the 33,000 emails that are missing."